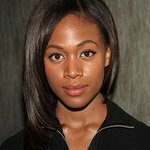 Nicole Beharie is best known for her roles in American Violet with Alfre Woodard, and most recently The Express. She’s a passionate philanthropist using her education as a Julliard graduate to give other children a voice to express themselves and tell their stories through the arts and other activities with ASTEP (Artists Striving To End Poverty). Google trends for "Nicole Beharie"
We don't have any videos related to Nicole Beharie.